The self -described "Hillbilly Gardener" lives In the banana belt above Scotts Valley Civic Center. Technically, Richard Hencke says he is 1/4 German, 1/4 irish, and 1/2 hillbilly from his childhood in Texas and Oklahoma. A true gardener at heart, Richard spends much of his time as an emergency room doctor at a local hospital and the rest of his time tending his garden. With trees and plants collected in his early days as a Boy Scout in Port Arthur, Texas, as well as plants acquired from the far corners of the earth he has created a spectacular landscape surrounding his home. "They'll carry me out of this property in a pine box", Richard says. He clearly loves his personal arboretum. On a clear spring day recently, Richard gave me the royal tour. I visited this garden 2 years ago and I couldn't help but be impressed with incredible growth he has coaxed from his many blooming trees, conifers and vines. The Pride of Madeira spikes glowed in the sun, some cobalt blue, others vivid purple. Early spring blooming shrubs and perennials offered color at every turn. One of his passions is allowing flowering vines that grow up into the canopy of his trees which adds one more dimension to his landscaping. A Blood Red trumpet vine is happily inching up a redwood trunk while a butter yellow rosa banksia scrambles into an oak. On a fence along a walk a spectacular blooming double white pandorea vine has found a home in a Butternut tree he got in Pennsylvania. 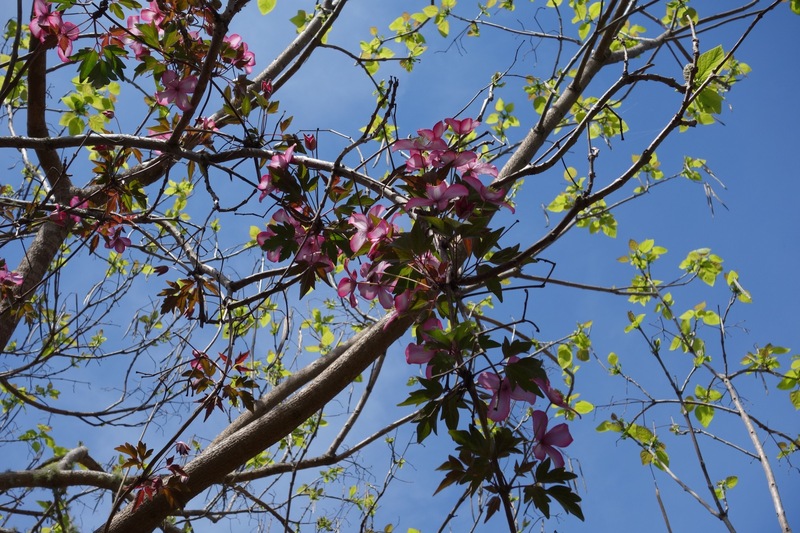 A rose colored anemone clematis nearly covered the trunk and branches of a dormant catalpa. Fragrance and color as well as good "bones" or structure make Richard's garden breathtaking. He nurtures each seedling with the same care he gives to the large trees. I laughed as he pointed out a 15 ft tall aralia elata that was transplanted from a tiny dish garden received many years ago as a gift. One of his favorite trees is a white pine gleaned from his grandmother's place in the Blue Ridge Mountains in Virginia. A black cottonwood he picked up in New England, 2 maples hail from New Orleans and the sisal agave grew from tiny pups he found at a rest stop on Hwy 280 in case he ever wants to make rope or twine. Richard likes to naturalize Hawaiian native plants starting them mostly from seed collected while on vacation. He has several Sacred Koa or A'ali'i growing on the property. Since this dodonaea species grows at 5000 ft elevation up Moana Loa they have adapted nicely to his Scotts Valley climate. I wouldn't be surprised if Richard goes into the canoe or lei making business when his trees grow up. A small portion of Richard's garden is fenced but most is open to the deer. So far the branches growing through the fence of his bright golden pea-like Eutaxia obovata have not attracted them. 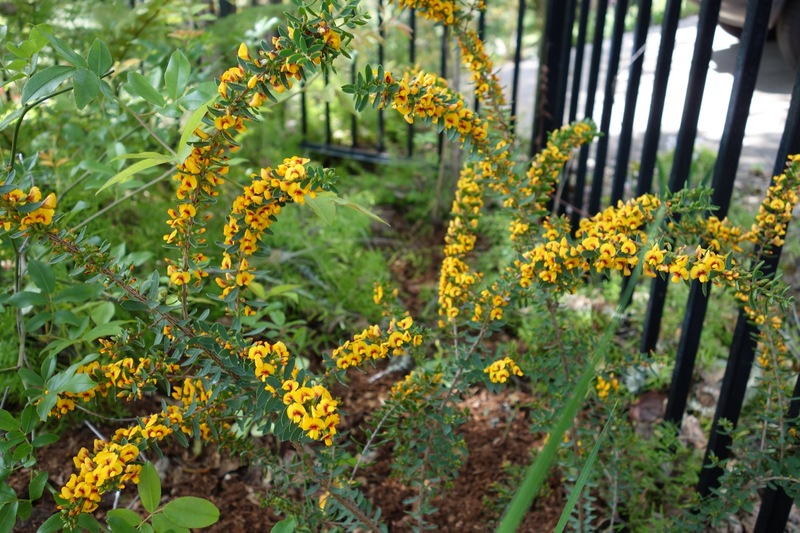 Also known as Egg and Bacon shrub this plant is a compact shrub originating from Western Australia. It's graceful fountain shape really shows off the thousands of flowers adorning the branches. Like all devoted gardeners, Richard likes to share plants with others. A couple of years ago he sent me home with one of his F-2 hybrid Douglas iris and this year a dendrobium orchid. I'm hoping more of his cuttings of the Sacred Flower of the Andes ( Cantua ) take and maybe I'll be lucky to get one of these, too. A day in Richard's garden is always a magical experience. Recently I had the honor to tour a remarkable garden in Scotts Valley. This horticulturalist calls himself a hillbilly gardener but he is no such thing. Some of his plants come from as far away as Oklahoma, Texas and Hawaii. What a thrill to see spring growth emerge from the new leaves of his unusual trees, flowering shrubs and perennials. Our first stop was to admire his large collection of echium candicans or Pride of Madeira. These stately shrubs reach 5-6 ft tall and 6-10 ft wide so they make quite a show when the huge flower clusters are in full bloom. Being deer resistant and droug ht tolerant they are perfect for our mountain environment. The color of the spikes varied from pink to lilac, sapphire blue and purple. This gardener is resourceful. He got many of his seedlings along Hwy 17 where they had reseeded after being used as brush to stabilize the slopes after the ’89 earthquake. The bees were really happy visiting the hundreds of blossoms on the beautiful spring day that I was there. Tucked under wild cherry trees collected in Texas, are second generation iris of dark purple and pure yellow. Originally from his grandmother’s garden in Virginia, these iris are descendants from a light blue variety and a pale yellowish-beige douglas iris. This extraordinary gardener also has a huge wild rose from Missouri covered now with fragrant white flowers, a wild olive from Texas and a sand plum from Oklahoma. There is a yucca about 4 ft tall that he and his brother started as cuttings when they were teenagers in Port Arthur, Texas. He is also the proud father of a couple of bald cypress complete with "knees". This tree of southern swamps and other low nutrient areas grows woody projections above the ground or water level to act as a structural support and stabilizer allowing them to resist very strong winds. Even hurricanes rarely overturn them. A beautiful Canary Island palm, planted from a seedling in 1996 that he had nurtured in a gallon can, is now over 9 ft tall. Akebia vines grow up oak trees, passiflora and white wisteria vines up redwoods, a yellow banksia rose rambles up into a madrone and madevillea laxa is happy growing up an oak, too. A willow-leafed hakea salicifolia, indigenous to New South Wales and Queensland, graces his entry with its tiny, white fragrant flowers. Other trees this gardener loves include Causarina, native also to Australia, sugar pine, incense cedar, Western red cedar, deodar cedar, staghorn sumac and a maytens tree. His mother in Pennsylvania taught him to plant his first garden at age 4 and he cherishes his Eastern white pines, pinus stroblis, and giant sequoias, three of which he grew from seed. And I can’t forget his collection of salvias. The red flowers spike of salvia confertiflora bloom year round. The beautiful salvia mexicana will soon to be covered with rich, blue flowers. He also grows salvia chiapensis and a salvia-like plant native to Hawaii called salvia lepechinia. This deliciously scented plant will be covered soon with reddish lavender lipstick-like flowers adored by hummingbirds like all the salvias. A new greenhouse where he has a small collection of orchids will soon house new seedlings that are sprouting in a germination station under lights. Of the many Hawaiian seeds he has collected are maile, a flowering plant that is probably the oldest and most popular material used in leis by early Hawaiians, milo- a chocolate and malt powder popular in many parts of the world, gossypium tomentosum, coral vines, hibiscus and the koa tree. There were hundreds more cool plants I learned about and got to admire that day. I’ll be visiting this garden again and again for the next round of wonders. it’s a marvel.